The Birthday Massacre’s third album, Walking With Strangers, further cemented their place in the hearts of fans everywhere, while gaining them countless new ones worldwide. 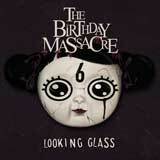 Now preparing to embark on a North American tour with Mindless Self Indulgence, the band presents the Looking Glass EP. As the second single off of the album, “Looking Glass” is ablaze with driving guitar hooks, intricate keyboard melodies, and Chibi’s sinful vocals. In addition to the title track, the EP contains mixes of fan favorites “Red Stars,” “Falling Down,” and “Weekend,” as well as two new tracks, a cover of the classic song “I Think We’re Alone Now” and the video for “Looking Glass.” Never a band to fall short of expectations, The Birthday Massacre have once again surpassed the expected, and created an EP that outshines most albums.